ohyasales has no other items for sale. There are 3,983 items available. Please enter a number less than or equal to 3,983. Sales tax may apply when shipping to: IA*, MN*, OK*(8.375%), WA*. Great transaction. Quick and Professional. Thank you! Delivered on time and well packaged. item was excellent as described. Item as described with fast shipping. Thank you. Exactly what I needed. Great price. Thanks! The additional round this holds is nice, but the extension to the grip makes a big difference. A woman with small hands might not care one way or the other for the added grip room, but guys with large hands will love it. This mag provides just enough extension to allow you to get your pinkie on the grip, instead of having it curled underneath. That might not sound like much, but it provides additional control and confidence. The weapon just feels better with this magazine. I love my Springfield XD-9. I'd love to own a Kimber Custom .45 ACP. But this little pocket .380 is my everyday carry weapon. 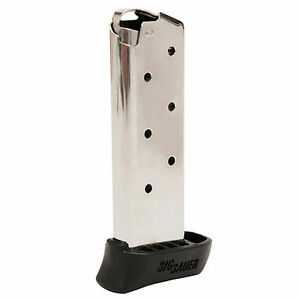 This mag makes a good handgun even better. P.S. I have found that the Winchester .380 in the white box does not feed well in this Sig. My friend with the Bersa Thunder says the same thing. You have to slap it in pretty hard to make sure it sits properly within the handle. The extra finger space made possible with the extension still isn't enough for your pinky finger to find a place to rest. A little overpriced as well. But functional and hasn't yet jammed. 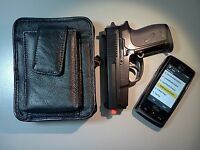 This was exactly what I needed to make my Sig Sauer P238 a perfect fit for me! I love my gun and the extended finger grip was just the ticket to make it better. This is an awesome gun without the extended finger grip but it's more comfortable with the extra space for my pinky to rest. 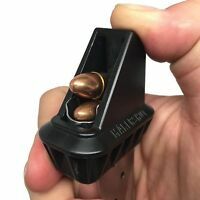 The magazines are easy to load and fit perfect. I put 50 rounds through them the first day without one malfunction. Cannot say the same for my Kimber 9mm extended mags :-( I bought two and highly recommend the extended magazines and the gun! The Sig P238 is a GREAT shooting .380 carry pistol. It has fantastic night sights and is very accurate for such a small pistol. BUT, adding the 7-round extended magazine makes it an even better shooting pistol because the extended base plate lets you wrap your pinky finger around the magazine for a tighter grip and better recoil control. Anyone who owns a P238 should carry it with the extended mag. These cost around $46 direct from Sig, but you can get much better deals on eBay. Ok...what is there really to say. If you know Sig Sauer then you already know they manufacture and sell top quality replacement parts. Why would one go somewhere else to save a few dollars and risk malfunctions just when your life may depend on reliability? I need to know I can rely on it when and if the need arises. I sure hope I never need to, but it is reassuringly nice to know it is going to work, no ands,ifs or buts about it. Thanks for listening. Life is good!